A romantic color mix of burgundy and airy blue today. These shades are perfect for the mild autumn days, matched together create an irresistible color combination and make the outfit look brighter :) Isn't it? The blouse is very pretty and I like the matching make up! Happy Monday! Bellissimo il primo piano Lilli, ti dona tantissimo il make-up! Che bella che sei Lilli con questa acconciatura! HI Lilli, burgundy is so in style now. Love your burgundy boots and your floral top is is so feminine. Have a wonderful day. Lilli, you always look amazing in any shade of red and burgundy is no exception. Your hair and makeup is beautiful as well. Happy new week. 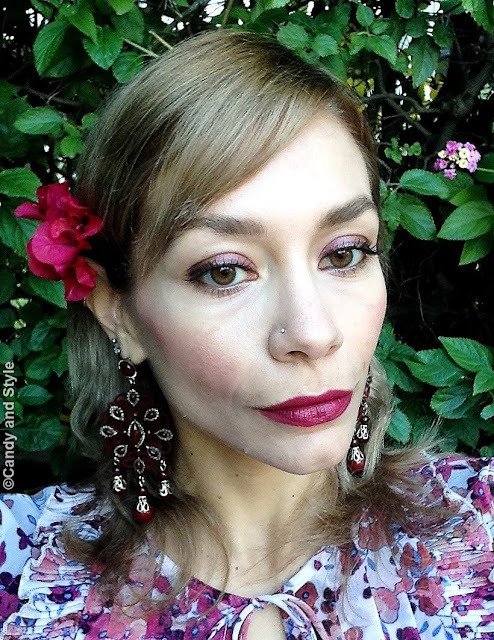 Quella blouse è così romantica, amo il bordeaux e poi il tuo make up è splendido!!! I love, love, love this burgundy look! I especially love how everything is so cohesive! The outfit and the makeup match just perfectly! <3 You definitely gave me a lot of inspiration both for fall fashion and makeup. Though, I must say that I am jealous of the warm weather that I can spot in your pictures, because Latvia just a few days ago was covered in snow and the temperature is still in minuses. Love, love, love your Make Up, dear Lilli. This brighten your beautyful eyes so much up. But also your outfit is pretty nice, perfect for the mild autumn The high waist pants looks fantastic for you. I love this combination, the burgundy booties are very pretty, and the makeup you wear feels great, I loved the lipstick, you look radiant Lilli! Happy start of week. You look so, so lovely my dear Lilly, love the color combo, a great romantic look! Love the blouse, feminine in every detail!